Now, it’s no secret that we’re good buddies with Blogtor Who owner, Cameron K. McEwan, and when we heard he was coming out with a Doctor Who book that would act as "a whovian guide to friends, foes, villains, monsters and companions", we were very excited indeed - especially considering his vast knowledge and love for the show. Once you finally get over adoring the beautifully embossed ‘Doctor Who’ lettering on the cover, which also features The 10th, 11th and 12th Doctors (yes that is the correct numbering), you are presented with the simple, yet effective contents page that typifies this straight-up, no-nonsense guide which does exactly what it says on the proverbial tin. The various sections within the book (The Doctors, The Companions, Friends & Allies, Robots, Time Lords & Ladies, Villains and Aliens & Monsters) are laid out beautifully and clearly in alphabetical order to easily find who you want. As you thumb through pages and pages of character breakdowns, coupled with pictures and illustrations gloriously brought to life by Andrew Skilleter, you realise just how concise the book is. With over 50 years to draw from you will find information about characters you have long since forgotten (Rita from The God Complex), or even facts about the ones you thought you knew everything about. 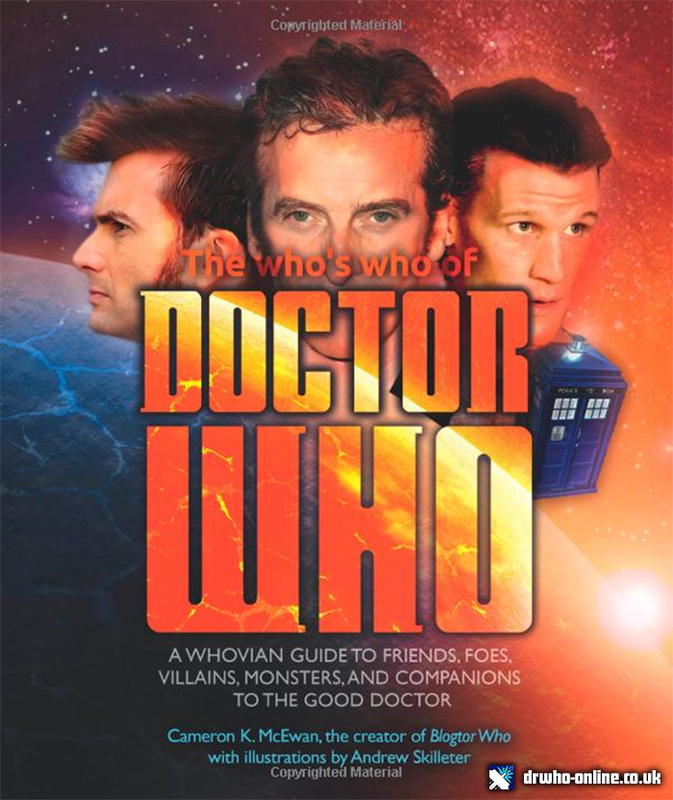 The Who's Who Of Doctor Who is essential reading for anyone wanting to know anything from 'Ace' to 'The Zygons', and with over 300 entries to explore, you’ll be reaching for it time and time again. + The Who's Who Of Doctor Who is Out Now, priced £18.99. + Buy this book on Amazon.co.uk for just £15.77. + Follow BlogtorWho on Twitter. Review: [Book #1] Death Riders / Heart of Stone - BookDeath Riders / Heart of Stone, Book Review for Doctor Who Online.Review: Doctor Who Memorabilia: An Unofficial Guide To Doctor Who CollectablesDoctor Who Online's Book review for Doctor Who Memorabilia by Paul Berry.Review: The Big Book Of Lists - BookDoctor Who Online's Book review for The Big Book Of Lists by Cameron K. McEwan.